This piece does such an incredible job crafting a vivid imaginary product narrative it led to a debate on what to call the technique. John Battelle creates a future world where Walmart and Amazon compete over fully portable user data. The power is in how effectively the story is able to clarify a number of highly complex topics. Many of us have heard of the Jeff Bezos practice of creating a press releasefor a hypothetical finished product to help guide meetings. If anyone knows what this specific type of product storytelling would be called, please reply. Some terms that may qualify: Fictional Design, Human-Centered Design Storytelling, or maybe “Futuristic Design Storytelling”. Right now when we open Apple News, there are two sections at the top. The first is curated by humans, the second is curated by algorithm. When it comes to high quality news recommendation, machines are not there yet. We’ve had a good deal of experience in building content recommendation systems (fun fact: you can try our free “personalized” news app attheedge.app) and remain skeptical that an algorithm can understand the nuances of language enough to create genuinely smart news recommendations. 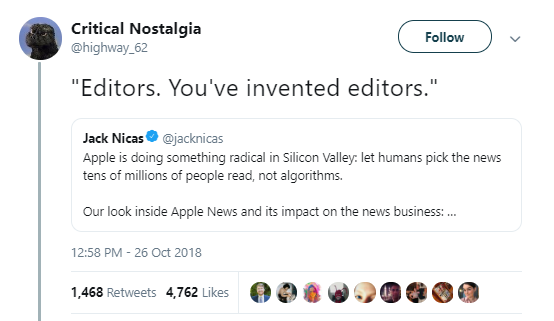 Until very recently, humans were uncool and everyone wanted to hear the terms algorithms and AI. That’s changing. In this longread, the NY Times takes us behind the scenes to the real-life journalists who pick the top stories for the 90 million Apple News users. We are highly supportive of any new tools that help you become a smarter reader, and are loving this new feature from the Financial Times. It gamifies news consumption, letting you accrue points on specific subjects as you read, to help you track (and maybe compete on?) your specific subject knowledge. 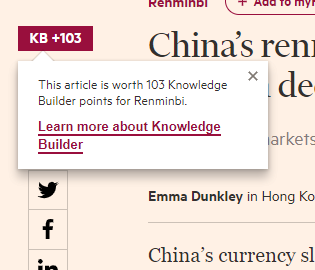 For example, if you scroll to the bottom of this article about the Chinese currency, you are awarded 103 KBs (not to be confused with kilobytes). For more context — the FT put out a more technical explanation of the projecton their Medium, and are also expecting an uplift in subscription revenue from the product. Welcome to the future of product placements. Amazon Studios is beginning to work with other Amazon departments on the next level of product placements. An example would be Project Runway hosts Heidi Klum and Tim Gunn are launching a fashion show that will have “shoppable” elements in collaboration with Amazon Fashion. Product Hunt’s newsletter would be on the syllabus of any course in modern newsletter-ing. It was way ahead of the curve when it comes to including emojis and GIFs, and even more importantly, is an example of a company that evolved a newsletter into something greater. 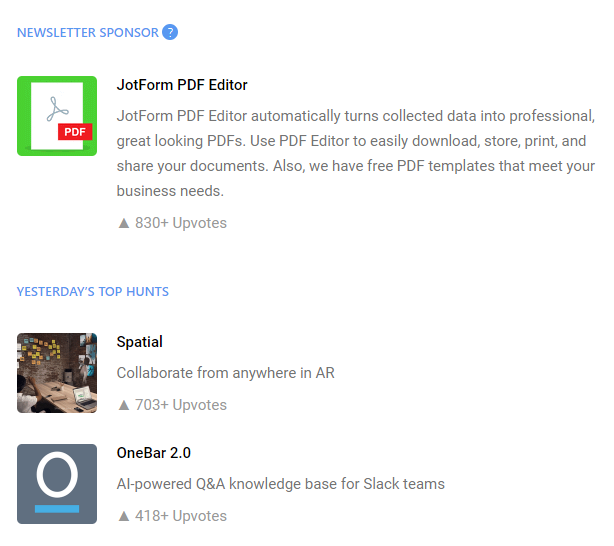 They started as an email roundup of product recommendations, and turned that into a full-fledged community-powered portal showcasing the latest and greatest new tech offerings.